The 3 Things You Do To Sabotage Success: How To Stop Limiting Yourself! The holidays are here and among us like aliens masked as friends. Not the cute E.T. type aliens, more like Alien vs. Predator type, the kind that want to rip your spine out with your skull as a trophy. A New Year means that it's also time for resolutions and grandiose plans for ourselves and our lives. They could be changes in our behaviors, or changes in our jobs, or perhaps an itch to travel that needs to be scratched. But like a parasitic worm, there's ONE major problem that will destroy even the best resolution. It's the danger of self-limiting beliefs. The problem with changing habits or making any substantial changes in our lives is that we are often sabotaging our chance for success without even knowing it. 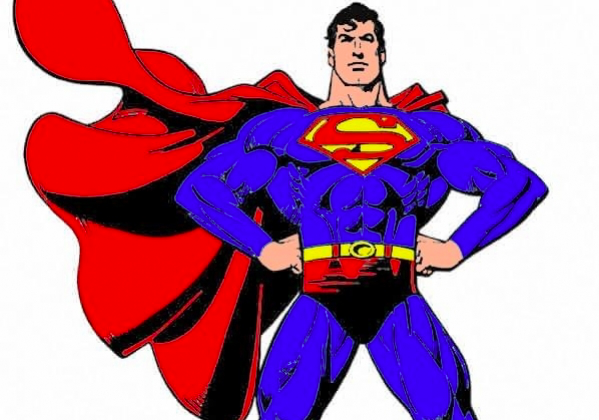 While we're busy trying to become Superman, we're often wearing a necklace made of Kryptonite. If you want to make changes in your life, the hardest part isn't getting started or changing negative habits into the ones you desire most. No, the most challenging aspect of these changes are the ones that can act as the most harmful to whether you succeed or not is: simply your beliefs. If you believe you'll succeed or not has a large influence over whether you'll effectively make the changes you want. I'm not talking about faux concepts like "fake it until you make it" or imagine it and it will come to fruition. But if you do believe that you can do something, all research points to the fact that you should succeed. The single most influential factor in psychological research about behavioral change is that it is the positive mindset that differentiates between success and failure. If you doubt you can; you don't have enough training or the right type of schooling, or you don't know how, so you don't even try to get off the couch - whelp - you guessed it! You have zero chance to succeed. That's called the power of self-limiting beliefs. (In the past, we've discussed what is success in a world that judges your outcomes - this is about stopping our tendencies to limit ourselves). A recent article I stumbled upon got me thinking about the power our confidence and doubts play on our potential for success or failure. If you believe in you can accomplish something, you can. If you doubt you can do it, you can't. 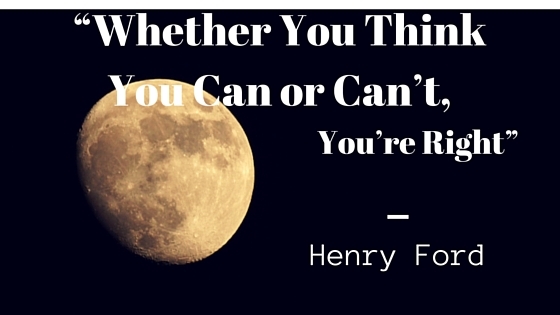 It's the truth of self-limiting beliefs that we can only accomplish what we believe we can. But in Henry Ford's own vernacular, if you believe you can do something or believe you can't, either way, you're correct. When we believe we are capable of something, we find mechanisms to overcome any challenges that present themselves along the way. Get Off The Couch And Get Moving! For example, if you just ate waaaay too much this past holiday and feel you want to lose some weight, you probably feel motivated to get started. You go out and get new running shoes, a new workout outfit, get ready for bed, set the alarm clock to wake up early and when it goes off? You end up hitting the snooze button, negotiating with yourself that you'll get started in just a little bit, or later in the day, or tomorrow. Or perhaps you climb out of bed, lace up your shoes, head outside, and begin to run. You start to breathe heavy; your legs are plodding into the concrete like they're trying to anchor themselves to the ground, and you slow down to a mere walk. Somehow you've forgotten just how difficult it is to start a workout regime but being reminded by your body loudly just how out of shape you truly are. You finish your routine and go about your day. Slowly, you become sore in places you forgot about, stiff in others. The next morning, you're not as enthusiastic as you were the day before. You're sore, tired and it takes a little more momentum to begin. It's harder to lace your shoes, to get outside and start. It becomes easier to quit earlier than the day before and before you know it, you've walked twice the distance from the day before. The limiting belief is that it's too difficult to lose weight. So when obstacles appear, you false-start or quit too early. But if you reexamine the outcome, and your approach is rethought, motivation and follow through are much easier to maintain. The main problem in the examples above were in the failure to establish more realistic goals with the by-product (outcome) being losing weight. You can't believe in the outcome solely and have expectations of being successful. You need small, manageable tasks that add up to the desired benefits and goals. If the desired outcome is to lose weight, setting more manageable goals while developing a reward system works much more effectively. Instead of getting motivated to lose weight, try to focus on exercising in a short, limited amount on an every-other-day basis. 1) Decide On Change: Make a decision on what it is you want to change about your habits. It isn't until we decide that something needs to change and we are determined to change it that true action and habit development can begin. 2) Create Manageable Tasks: Once you've decided the action you want to take and the desired outcome you want, work backward from that point. Create a list of small actions and tasks you can make daily. Small repetitions and accomplishments over time build up to a monumental change. 3) Evaluate Your Beliefs: What you believe goes along way toward success. Discover what doubts you have; what self-limiting beliefs are you repeating to yourself that are having the negative effect on your changes? It's only through understanding our motivations and mindsets that we can overcome the barriers we create for ourselves. By making a decisive choice to make a change, creating daily micro-accomplishments toward the end goal and examining what beliefs may be limiting performance is the best routine for you to make lasting, permanent changes in your habits. Often we limit ourselves by stressing our energy resources. By placing too much stress on our energy stores, we have very little left over for change or resistance as it comes about in our day. We become creatures of habit, rather than purpose and that is directly correlated with lack of sleep and energy. There's only so much time in the day and you have only so much energy. Prioritize your important tasks after you've had a chance to recharge. Get a proper amount of sleep, setting the alarm for the same time every morning, and take mental breaks throughout the day. Exercise or meditation are great ways to recharge your brain. As you start out on making your habits permanent, one of the most important things is to make them routine. Too often we fail by taking a break just when things are becoming more difficult. But if you're serious about the changes you're trying to make, then stick-to-it-ness is critical for success. After the first week, treat yourself to a movie (avoid the popcorn), a show, or some other activity you enjoy. After a few weeks, if you meet your exercise goals, treat yourself to something you value a little more, say a new pair of shoes or a nice dinner out for example. The idea is to make your incremental steps more manageable and believable. And in the process of taking additional steps, we're able to get much further. If you'd like to make a positive change in your life, your health or habits, get The Power of Habit: Why We Do What We Do in Life and Business by Charles Duhigg from Amazon by clicking the link. Truth is, you'll find the paperback, hardcopy or ebook format you want at an incredible price and I'll receive a small commission for helping you find the book.